Rooms may vary significantly, depending on the category of the hotel and the room itself. 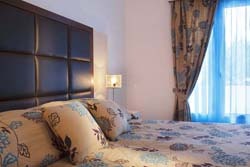 There are several room categories, the most commonly known are the standard, superior and deluxe rooms. What features does a room have? One thing is for sure; rooms are NOT self-catering accommodation units. So, if you wish to prepare meals during your holiday, then you've better reserve a studio or apartment instead. So, rooms can be standard, offering only the most basic amenities and furnishings, or they can be luxurious, offering great view and many extra amenities.